Connect with parents beyond assessment progress and reporting. Allow parents to interact with the school and engage in their child's learning far beyond the confines of the parent portal. Parents receive push notifications for new announcements, events and teacher messages. When enabled by the school parents can start conversations with their child’s teachers, keeping communication within the context of the diary. Parents can opt to receive homework summaries that keep them in sync with their child’s progress on weekly basis. No more “but I don’t have any homework”. Parents can see their child’s homework deadlines, details and attachments. 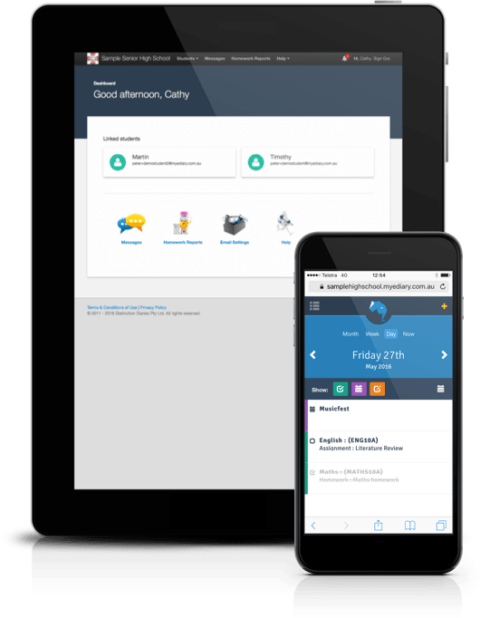 Using MyEDiary parents can receive announcements, newsletters, permission slips, school policy information and notices. Complete access to their child’s school calendar. Notifications are always sent through for changes and cancellations.